If you have a temporary need for nonagricultural workers, the H-2B visa might be for you. If you are in our service area, Montana, North Dakota or Wyoming, please review our guide below on the H-2B visa, or if you need help now, please contact us. This H-2B visa guide is an article in our series of US Visa Types. Getting temporary workers begins with the employer and its need. An employer must show that there are not enough US workers who are able, willing and qualified to do the temporary work. In addition, the employer must show that the H-2B workers will not adversely affect the wages and working conditions of similar employees in the United States. Lastly, the employer must show that it has a temporary need. Category one is a one-time occurrence. Employers in this category must show that it has an employment situation with a temporary event of short duration that created the need for the temporary workers. Additionally, it must show that it has not employed workers to perform the services in the past, nor will they need them in the future. An example is always helpful in explaining DOL and USCIS rules. If a brewery say wanted to increase its capacity by adding stainless steel tanks for storage, it could use H-2B visa program to get welders to fabricate the tanks. Category two is for employers with a seasonal need. The employer must show that its need for workers is tied to a season of the year by event or pattern and that occurs every year . In addition, the employer will also show that there is a period of the year when it has no employees. The classic example of this case is a hotel located in a resort town. A hotel located in Gardner Montana would have a summer season as tourists flock to Yellowstone Park. When winter comes, the hotel would close due to insufficient paying guests. The hotel would be ideally situated to get housekeepers and desk personnel through the H-2B visa program. Category three is for employers who have regular workers but during certain times of the year, extra business causes the need for more employees. The peak load could be seasonal or a short term unexpected need. Besides showing need, the employer must show that the temporary workers will not become part of the employer’s regular operation. Examples that illustrate this concept are a convenience store located along an interstate. The convenience store would have employees all year long. But during the summer travel season may wish to be open 24 hours a day. Alternatively, during the winter months one employee can service the store. But during the summer the employer can keep five workers busy. For a nonseasonal example, an automobile dealer may learn that a recall will create a huge need for auto mechanics until the dealership has processed all the cars through the recall. Category four requires the petitioner employer to show that it is not employed permanent or full-time workers to perform the services in the past and that it occasionally needs temporary workers to perform services a labor for short periods. Few employers can fit into this category. It would work best with a contractor that does not use permanent employees, but needs to hire temporary workers for odd jobs. An example would be a contractor that erects stadium style tents at rock concerts. Once the employer determines that it fits into one of these categories, it is ready to begin the H-2B application process. In our beginning description of the H-2B visa program, we mentioned that the employer must show that there are no ready willing and able workers, and that employing the H-2B visa workers would not affect wages. The DOL process for making sure of that requires the employer to first ask for prevailing wage. The employer provides a job description along with experience and training requirements to the DOL. Next, DOL advises on the wage rate required for the position. After that, the employer uses that wage to place advertising to DOL specifications in a Sunday newspaper to attempt to locate qualified US workers. If no US workers apply for the position, the employer reports that fact in its recruitment report to DOL. The employer also supplies documentation about which of the four categories of need it qualifies under. For new employer, DOL often requests extensive and detailed documentation of this temporary need. Assuming that it finds all the evidence compelling, the DOL will then certify the employer’s need. With a temporary labor certification in hand, the employer can now petition the USCIS for H-2B visas for the workers. The USCIS requires the employer to once again show a temporary need. Also, the USCIS requires the employer to prove that the prospective employees are from one of the 68 approved H-2B countries. To get on the H-2B visa list, the countries have to show that its workers return home after the H-2B visa employment in the United States. Besides showing that the prospective employees are from an approved country, the employer must submit when the USCIS has H-2B visas available. Only 65,000 H-2B visas are available each federal fiscal year. USCIS allocates 50% of the visas for employment starting in the first part of the year. The other 50% are for employment starting in the second half of the year. If you meet these requirements, USCIS should approve the petition. USCIS also notifies the consulate where your workers live so that they may apply for the H-2B visas. With an H-2B visa in hand, CBP will admit them to the United States to start work for you. Do you have a temporary need that fits into one of the four categories described above? If so, we can assist you in preparing to file an H-2B visa petition. Often employers are unaware of how slowly DOL and USCIS work on these petitions. We therefore recommend starting H-2B visa process at least six months before the employer’s date of need. 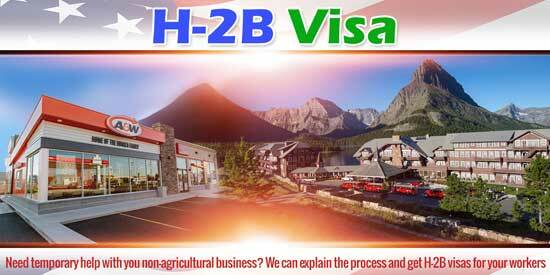 Please contact us for your H-2B visa help.